Effects: bactericidal, antiseptic, antiviral, expectorant, diuretic, activates mental activity, stimulates adrenal function, strengthens hair, stimulates the immune system, purifies the body of toxins, improves microcirculation, tones, deodorant, purifies and restricts the spread of infectious diseases by air. Benefits: The numerous health benefits of pine essential oil have made it one of the most important essential oils used in aromatherapy: it has antibacterial, analgesic, diuretic, energizing and aromatic properties. Pine oil is popular for its use as an ingredient of pharmaceutical products; its antiseptic characteristics are used in treatment of infections of the respiratory track and sinuses, coughing, bronchitis, asthma, flu. It demonstrates toning and refreshing effect; it removes anxiety and nervous tension, and is useful for people suffering from loss of concentration or memory. 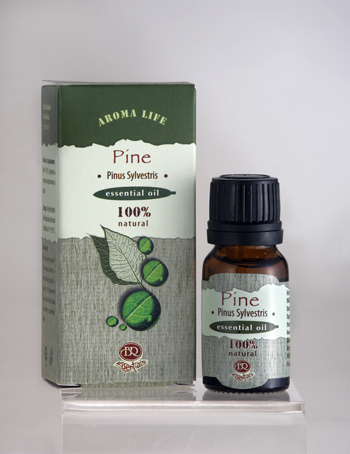 Another important health benefit of pine essential oil is in treating various skin problems. Dermatologists often prescribe the oil in treating psoriasis, itching, pimples, eczema, skin diseases and sores. It gives your skin a balanced, smooth, renewed and shiny appearance. This oil increases the resistance of the organism. Pine essential oil blends well with many other oils including cedar wood, rosemary, lavender, sage, juniper, etc., and hence can be widely used in making numerous aromatherapy preparations. Application: massage, baths, inhalation (aromatherapy lamp), after consultation with aroma therapist. Contraindicated for epileptics, hypertonic patients, nursing mothers, pregnant women, children and people with individual intolerance to pine oil. Used in high concentrations it can cause allergic reactions. Use only fresh oil, stored in a tightly closed bottle in the fridge. Longer inhalation of vapors may cause weakness and dizziness.